Note: If you're a FG member, remember to logon to Golf Genius on the web (not phone) to register for the event! Non-Members please email us at support@futuregolf.com.au to register for the event. 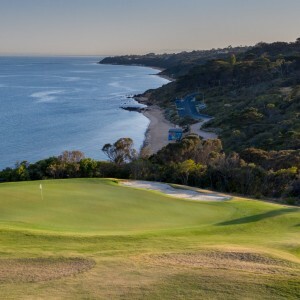 A new par 3 hole was built on the edge of the cliffs of Port Phillip Bay and opened with much fanfare in 2017. With 19 holes now at its disposal the Club is embarking on ensuring every hole in the layout is the best it possibly can be without affecting the play-ability of the golf course for members and visitors. The 9th and 18th holes have been redesigned and have enhanced the area next to the clubhouse with a massive new putting green and outdoor entertaining area for everyone to enjoy.